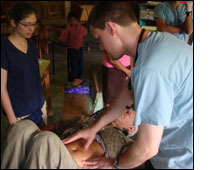 In June 2008 a group of healthcare professionals from Virginia Commonwealth University, in association with the non-profit group HOMBRE (Honduras Outreach Medical Brigada Relief Effort) traveled to Northern Honduras to participate in direct medical relief efforts as well as public health oriented projects. These activities occurred at 2 separate sites in Northern Honduras, one being located near the city of Olanchito and the other being located in the rural town of La Hicaca. Via the generous assistance of the Benjamin H. Josephson, MD Fund I was able to participate in these medical relief efforts directly at both of the above sites. A chief resident in internal medicine at Virginia Commonwealth University, I was able to precept medical students and internal medicine residents, as well as being involved in direct patient care and in the public health efforts of our group. On the trip I worked directly with my wife, Lillian, who is Honduran by birth and who is fluent in Spanish and very knowledgeable about local culture and customs. We saw hundreds of patients in direct clinical consultation during the trip over several clinic days at both Olanchito and La Hicaca. In the rural and hard to reach town of La Hicaca our group was also involved in a water filter project. This involved placing water filters in a number of local homes, providing education about their use and the importance of clean water, and taking cultures of their water supply before and after filter placement. Basic demographic information was obtained and it is our hope to follow these families over time to see if the use of these filters has a positive effect on the health of these families. Additionally, we randomly administered a needs assessment survey to people in both Olanchito and La Hicaca to help us better tailor our future relief efforts. In short, this was a highly successful medical relief trip to multiple areas of Northern Honduras where our group participated in both direct patient care and public health projects. My participation in this work was greatly facilitated by the terrific generosity of the Benjamin H. Josephson, MD, Fund and I want to extend my heartfelt thanks to this group for their terrific generosity and support!! !